The AWEX EMI closed the week on 1934c – up 7c at auction sales in Australia. This rise was the 5th consecutive weekly rise with a total price rise of 85 AUC (+44 USC). The 96.8% of the 38,830 bale offering cleared to the trade, as exporters seemed keen to get wool transactions completed before the commencement of Chinese New Year Holiday (4-19th February), where I anticipate there will be some second guessing of a new price level. Merino Fleece types was a bit of a “rewind and replay” with the best style and measured lots attracting solid competition and added 5-10c to their last week’s prices whilst the increasing number of lots containing poor style and strength, with high VM or mid-point breaks, attracted large discounts, falling between 20-40c. In general, the Northern MPG’s held a 1% premium over the other centres, which I believe would be based on the quality and measurement of the offering. Crossbreds posted another incredible price rise across the range of MPG’s with the rises of over 100c posted for the 30MPG and an 85-90c increase for the 28 MPG. The 25 and 26 MPG’s increased 45c for the week. The best prepared crossbreds clips were significantly dearer that any poorly skirted or unclassed lots. 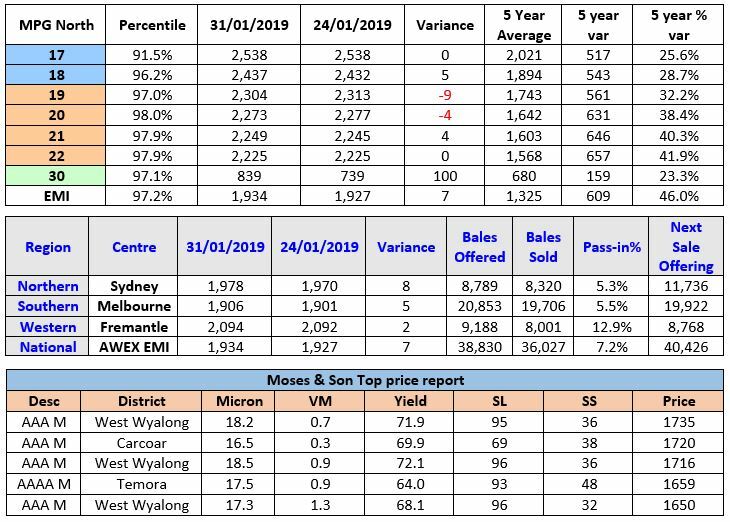 Forward Price Report from Michael Avery (Southern Aurora Wool): Better volumes went through the forward market this week. Buyers were looking to cover positions with ongoing concerns of supply still at the forefront. The auction started strongly with indent operators keen to fill orders prior to the Chinese New Year. Crossbreds were in demand and this followed through into the forwards with 40t traded in the May/June window at solid levels delivering excellent hedging opportunities. 21.0 microns traded at season high records of 2190 into Easter. The strong Australian dollar and continued modest demand saw interest in forwards taper off towards the end of the week with most merino qualities losing ground into the auction close. We see this trend continuing in weeks to come as processors balance the need to keep machinery with the inability to pass the current price levels onto their downstream customers. Risk levels remain high and volatility will be the constant.